SAINT-GOBAIN SOVIS designs, manufactures and supplies radiation shielding windows. SAINT-GOBAIN SOVIS does not only supply radiation shielding window . Thanks to its American branch HOT CELL SERVICES, SAINT-GOBAIN SOVIS provides its customers with a full range of services related to the use of radiation shielding windows. Most of these products are installed in nuclear waste treatment plants and laboratories. They allow a visual control of operations conducted on radioactiove elements into the cells. 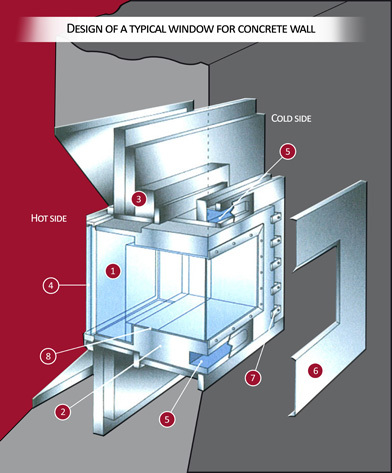 The wall thickness of the shielding windows can reach 1.50 meter and the weight may exceed 12 tons. SAINT-GOBAIN SOVIS also provides glovebox panels and X-Ray protection plates for medical radiology. Glass blocks assembly : the composition, density and wall thickness of the blocks are specifically calculated by our engineering department to provide the specified radiological protection and guarantee sufficient light transmission and life time. Wall liner (steel or cast iron) : the wall liner is embedded into the wall white the hot cell is built, sometimes several months before the installation of the window. Alpha glass : the alpha glass provides tighness on the hot side, to avoid the transmission of active particles by air circulation; it can be protected by a grid to prevent damages caused by telemanipulators.